Hello everyone! 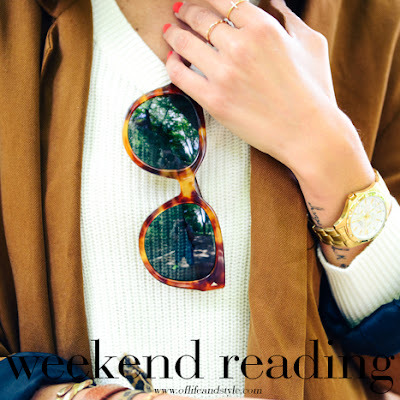 Back atcha with the Weekend Reading on it's actual day! Woot! This week has kinda been a blur of work, school and resting up from my weekend in Nashville. And next week is busier as I'm visiting friends who are in town for break and celebrating Thanksgiving with family! Can you believe Thanksgiving is Thursday? I swear we had like 3 weeks to go but nope, it's less than a week. And 2016 is basically here. Where did this year go?! Anyone know? Anyways, here's the links I loved for the week! Adele dresses up as Adele. Talk about Adele-ception! Cranberry mules perfect for the holidays! On my list of drinks to make! I love giving gift baskets for gifts all year round, but it's more fun at the holidays! Check out how to create the perfect gift basket! Turtleneck sweaters are super in for this season and I love how Caitlin styled this sweater dress one! Some GirlBosses and uber successful woman share advice they'd give their 20 year old selves. Love everything about this outfit from the hat to the color of the dress and the killer OTK boots. So chic and casual! Wish I could pull off a beanie and heels like this! Jimmy Fallon and J. Crew created a genius invention: the Pocket Dial. A phone case that looks like a pocket square! Sequins, plaid and red make for the perfect holiday outfit! 22 reasons why being single for the holidays is actually a good thing. Blair is perfection! She has impeccable style! This is hilarious! If this happened to me I'd probably punch them to be honest. What would you do? Love this honest article about being a young adult from Carly. I can definitely relate to certain things and it's nice to know that I don't have to have everthing planned right now. Reason #57 why J.Law is the best. Did you see the new page on the blog? I've been rounding up and adding new things to it every week! Check it out now for some inspo and a little gifting help! Purchased this beauty because it's already getting cold (boooo) so I might as well look chic! And it's under $70!